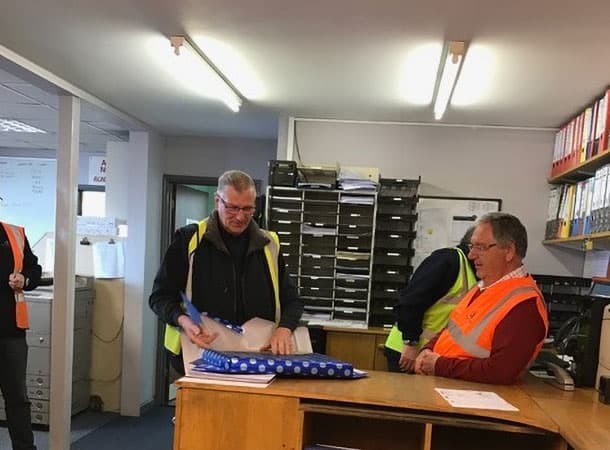 A Ferryspeed driver, who has worked for the company since 1998 has retired, following a great send off by his colleagues. Brian Davey first joined Ferryspeed in 1998 as an artic driver, which he continued doing until, at 65, he exchanged his lorry for a van and continued working for Ferryspeed on a part-time basis. Brian was known for his helpfulness whilst delivering to local chemists, surgeries and the hospital. Prior to working for Ferryspeed, Brian worked at Simco (a local pharmaceutical company) for 11 years. Brian’s retirement was marked with a presentation of a cheese board made of slate, cut in the shape of Guernsey, after which he celebrated with a holiday in Prague with his wife. He is now looking forward to a bit more home and leisure time but he says he’ll still be busy as he has plenty of jobs that now need to be done.